A high quality and simple allround kite. The Neo was made for easy use. Easy re-launch and predictable behaviour. This basic kite has three struts and a compact shape made for durability, You can choose between a 4 and a 5 line setup. 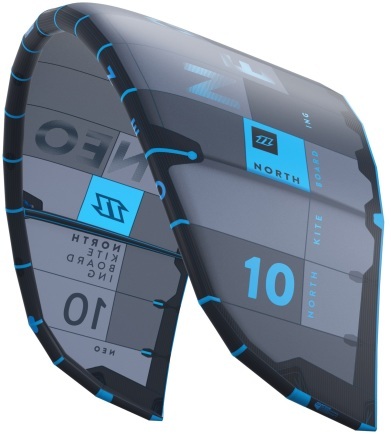 The NEO was put in the market for the riders that are looking for a basic kite and good value for their money. The kite is straightforward and the handling is easy. An allrounder will like the NEO for it's fast reaction, depower and stability. The NEO does not come with a lot of fancy features, it is a straightforward kite with a high quality finish. Reinforcements on the vulnerable places have been put in place to prevent wear. 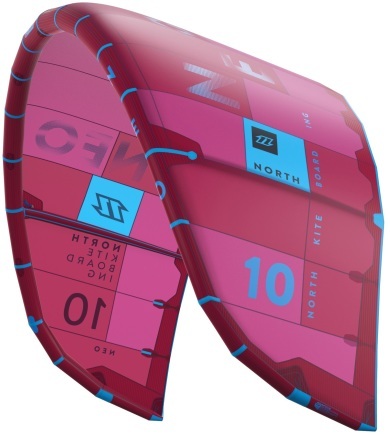 The NEO is a three strut kite and comes with the 2011 Truster bar (like the other 2011 kites by North Kiteboarding). You can choose between a 4 or a 5 line setup. In case of the four line setup there is a pocket in the leading edge to tuck away the 5th line. When riding the NEO gives a lot of feedback when it is at the edge of the wind-window, you know exactly where the kite is in the window. During gusts the bar pressure increases, but the power buildup in the kite is gradual and predictable. The feedback makes it very suitable for beginners. In a light wind session the NEO performed just fine, the kite turns quickly and builds up the power directly but still very predictable. The low good end does have as a result that it performs a bit less in the high end. In particular the riders who like to ride unhooked will notice that the sweet spot is not great. The NEO is an entry level kite. The kite is easy to use and this is where the kite scores best. A lot of feedback, gradual buildup of power, quick reaction to steering commands in combination with rather large turning circles give the rider enough time to anticipate and this is exactly what beginners need. The Neo could also be suitable for wave riders because of the reactive steering and the good low end, but the large turning circle is a characteristic wave riders are less thrilled about. Also, the drift of the kite (gliding along with the wind when there is no pressure in the kite and the kiter is riding a wave) is too slow, therefor the kite needs to be steered constantly (this effect is increased when riding 20M lines). The Neo is a great kite for entry level riders and beginning wave riders. Freestylers and specialists (like speed kiters) will run into the kites limitations and might want to look for a different kite. great kite for beginners, easy to fly, quick steering. However , I tried one out in Mauritius for the 2011 NKB dealer meeting and really liked it ! It has a C kite feel with good depower - feels spongey which gives the kite a real lively feel through the bar and its not bad in waves either . Hi, what I understand is that North made the Neo is a low budget step-in kite for a wide group of kitesurfers. Why is this kite build guys? North always has a big range, why a new kite?